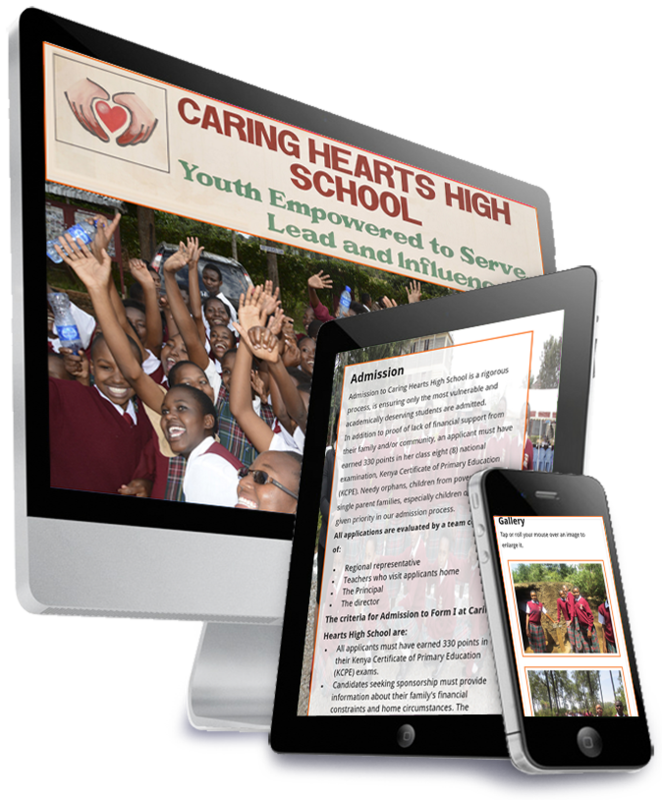 We are pleased to announce the new web site for Caring Hearts High School. In 2013 Caring Hearts and Hands of Hope board of directors in Kenya agreed that some of the girls we sponsor live in structures completely unfit for human habitation. Other challenges warranted the board to review to what we were doing and how best we could use the funds sponsors entrust to us. These challenges included unexpected disruption of studies due to strikes by public teachers or students and government mandated school closures for simple events like voting or voter registration, unexpected and unwarranted fees added to regular tuition (students were constantly suspended from school if they could pay these other fees), inability to closely monitor students’ performance and offer remedial programs until it is too late and Lack of counseling and guidance opportunities for very vulnerable students during the time in their lives when they need it the most. These factors made it necessary for Caring Hearts and Hands of Hope to operate its own girls and boys boarding schools. We purchased a boarding school facility for girls and started operating Caring Hearts High School in 2015. Plans are in plan to build a boarding high school for boys in the near future. Because of your enormous generosity, we have been able to transform the lives of so many poor children within such a short time, in addition to the fact that we are now operating our own girls boarding high school. But operating our own high school calls for a reality check. For how long can sponsors continue supporting the operations of the school? What would happen in bad economic times? Would that school survive and continue to operate without Dr. Vincent Kituku being involved? These are real, albeit disturbing, questions that must be addressed, for Caring Hearts High School to thrive with or without American sponsors, in any economy and without my integral involvement. The good news is that Caring Hearts High School can and should be self-sustaining within 3-5 years. In Kenya, private schools are in high demand and parents are willing to invest heavily in their children’s education. Currently, tuition for private high school ranges from $1,000 to $3,000/year per student. That is almost 2-6 times what donors invest ($600/year) to educate a sponsored student. Therefore, for CHHS to be self-sustaining, within a short time, we must capitalize on the existing demand for private education without compromising our objective of educating poor children who would otherwise languish in poverty if not given the opportunity to join high school. This goal can be accomplished. The school was designed for a capacity of 320. 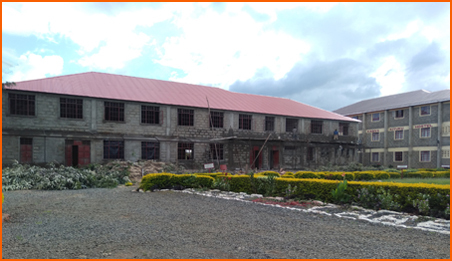 The dormitory’s first and second floors were complete, with a capacity for 220 students. However, currently, it could only be used by 160 students because the school lacks classrooms for more students. We have constructed 3rd floor (to protect the building from being destroyed by the elements) and make it possible for the school to accommodate 320 students in living spaces. A big advantage is that the foundation for the other classrooms was already in place. We constructed two classrooms including our school’s flagship Katy Benoit Life Skills Centre and two science labs (not completed). Our plan is to complete the construction of the remaining classes and teachers apartments by the end of December 2018 as well as constructing a much needed Dining Hall. Again, I am sensitive to your generosity, and would appreciate what God puts in your heart to help us with. Your contribution will make a huge difference. Dormitory for 220 girls at purchase and after third story construction was completed. About Katy Benoit Life Skills Centre-- Soon after we started operating Caring Hearts High School, we learned of a heartbreaking reality—innocent children from poor families, especially the girls, who are born without AIDS/HIV, too often contract it as they nurse their ailing parents. These children have no basic healthcare training or protective hygienic resources. 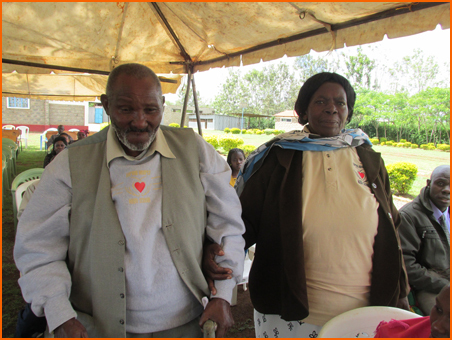 We had planned to start vocational training programs, sewing, home economics and other skills for independent living. The Life Skills Center has an inspirational aspect. It is a lasting memory of Katy Benoit, a young Boise girl, whose short life taught us about kindness, accepting others and the ability to achieve and thrive in academic endeavors. 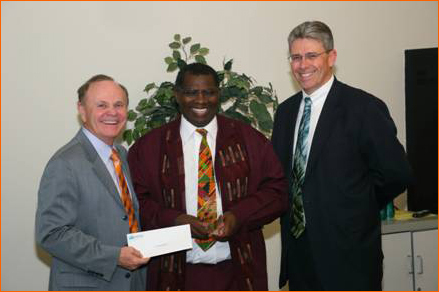 Since Caring Hearts and Hands of Hope (CHHH) started helping orphans, children of widows and those from poverty-stricken families, more than 750 high school and university/college students have received financial support. Today, there are hundreds of families and children with hope for a better tomorrow that they never had, because of the support they have received from Caring Hearts and Hands of Hope. Caring Hearts High School is now a reality! CHHH new classrooms under construction. The current iron structure used as a dining hall. The future multipurpose dining hall under construction. The compound around the tuition block. Caring Hearts Life Skill Students. The school garden for vegetables and some fruits. Duplex with a living room, two bedroom, kitchen and bathroom in each unit. Donate please. You kind and generous gift is appreciated in advance. Please talk to your family members, friends and colleagues about what Caring Hearts and Hands of Hope is doing: changing the world, one child at a time, and ask them to help. .
Caring Hearts and Hands of Hope, is a 501 (c) 3, EIN 27-3127770. Your generous donation will help prevent a destitute child from facing a possible life of crime, prostitution, child labor or forced marriage. Please feel free to call me at (208) 376-8724 or email at info@caringheartsandhandsofhope.com, to learn more about CHHH, or if you have questions. 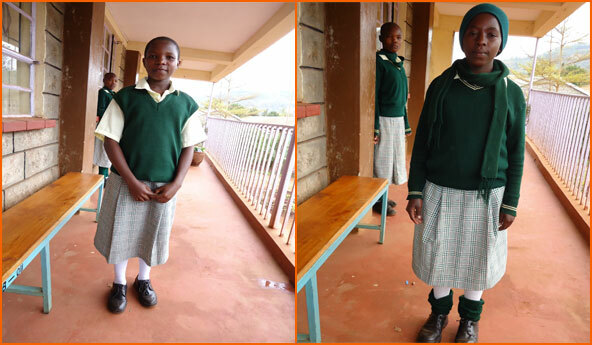 As with your sponsorship, your contribution is 100% guaranteed for the purpose of getting a facility for Caring Hearts and Hands of Hope sponsored students in Kenya. 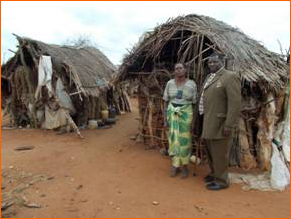 Sponsors and Dr. Kituku visit the house where one of the sponsored girls and her mentally ill mother were living. CHHH sponsors built a new house with a living room, two bedrooms, cement floor and an iron roof. built with funds donated by sponsors and other well-wishers. Sponsors and Dr. Kituku with the traditional Kamba baskets they were given at Kangundo Primary School after delivering 39 mattresses, blankets and bed sheets for blind students. 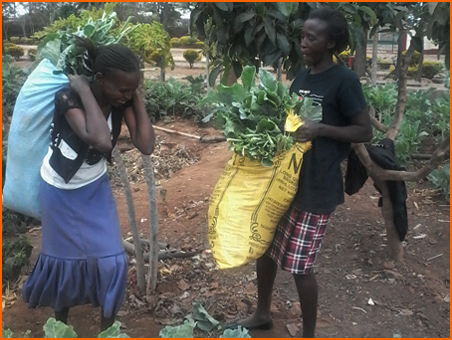 (their families are sponsors) pumping soccer balls before giving them to Kangundo Primary School students. 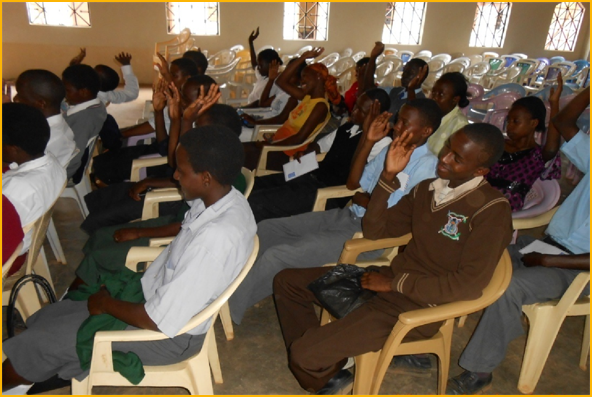 Sponsoring 238 destitute children (147 girls and 91 boys) in 72 different high schools. Paying for 21 students (13 girls and 8 boys) to attend universities and colleges. 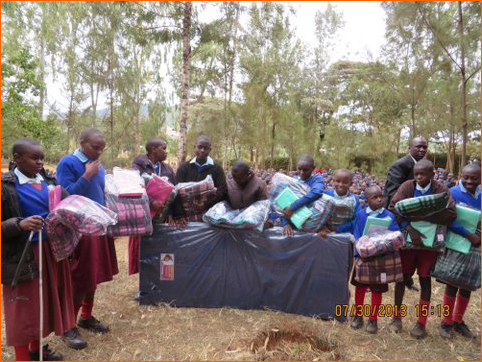 Provided 39 mattresses, 39 blankets and 78 beds to blind children at Kangundo Primary School. Started and completed five two-bedroom houses for widows. Provided two mattresses, four blankets, four pairs of bed sheets, one table and four chairs for each of the five families. Placed five blind children, one student with severe neck disability and one who suffers from albinism in special schools. 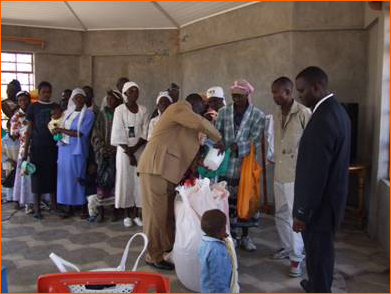 Kangundo Primary School blind children receiving blankets, mattresses and bed sheets donated by CHHH sponsors. What we have learned is that we are not just paying tuition and fees but saving lives and transforming families and communities. There are hundreds of girls saved from child labor or forced early marriage or prostitution. The circle of poverty is being broken continuously. 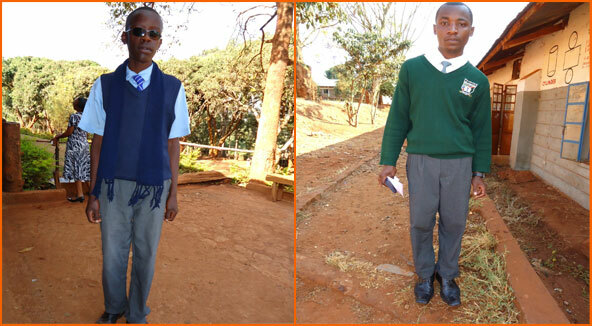 Left is a photo of a student before CHHH sponsor, Carrie, started helping him. The photo on the right is him and Carrie, four months after he joined high school with tuition, room and board paid for. Unexpected disruption of studies due to strikes by public teachers or students and government mandated school closures for simple events like voting or voter registration. This year, 2013, students in Kenya have lost about 30 school days due to teacher strikes and elections. This is extremely stressful for our students since school is the most secure place with enough food and opportunity and resources for private studies. Unexpected/unwarranted fees added to regular tuition. Students are constantly suspended from school if they cannot pay these other fees. There are students who have wasted a term (three months of schooling) languishing at home for lack of $15 not included in the fees structure that we received. Lack of a safe environment, with adequate food, security and opportunities for private studies for many girls and some boys when schools close. Inability to closely monitor students’ performance and offer remedial programs until it is too late. Lack of counseling and guidance opportunities for very vulnerable students during the time in their lives when they need it the most. Caring Hearts and Hand of Hope is the recipient of 2013 Community Champions Award that is presented by Molina Medicaid Solutions to organizations and individuals who are making a difference in other people’s lives and their communities. 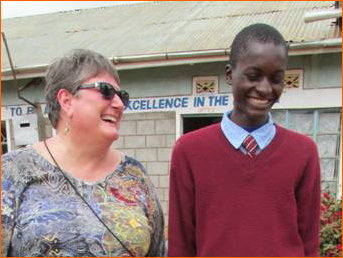 Dr. Kituku's November 15th interview with Dee Sarton of KTVB, Channel 7 in Boise, Idaho. What sponsors are doing is beyond touching lives. I cried when I met and heard the stories of some of the sponsored. 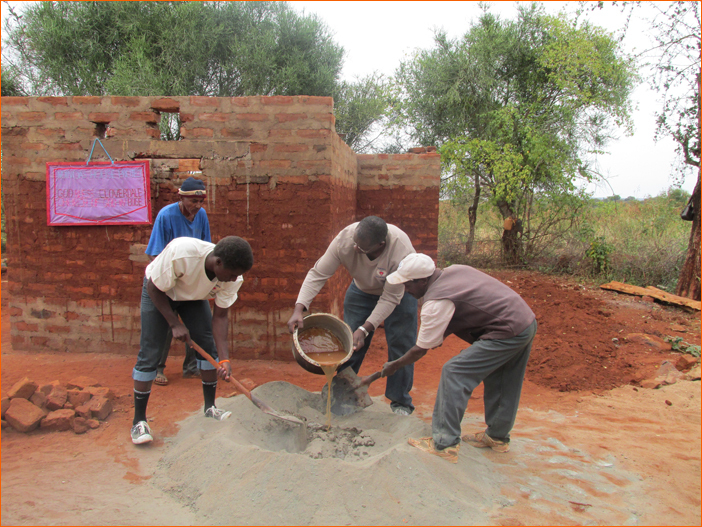 Vincent and his son, Kithetheesyo mixing sand and cement to construct one of the houses< br />sponsored by Caring Hearts and Hands of Hope in July 2013. One of the structures where a Caring Hearts and Hands of Hope student lives in. The family now has a new house sponsored by Caring Hearts and Hands of Hope. Joseph, a sophomore student at Tala high school, was expecting to be sent home the second Saturday after schools opened early in January. That day, he woke up, washed, dried and packed his clothes to wait for the school accountant to send him home for the lack of tuition and fees for first term of 2011. Remember, this is the boy who, as a freshman walked for miles searching for someone who could help him with tuition and fees. He had passed the high school entrance exam with flying colors. Yet he had no one to help. Bishop Matheka took his information and emailed it to me. 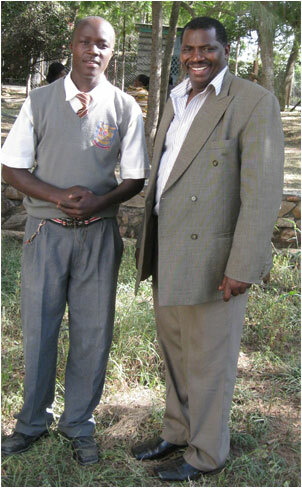 I wrote his story and a sponsor paid his tuition and fees. But Kioko, didn’t know how his tuition and fees had been paid. You can imagine his desperation and hopelessness when he saw the school accountant approaching him. But instead of being sent home, he was given a tuition and fees receipt, paid in full for the 2011, 1st term (January-April). Kioko, like most of the orphans, children of widows and those from poverty stricken families we are sponsoring, is a top student. He was number one in his class of 60 students. I had not notified the school that I was to visit. 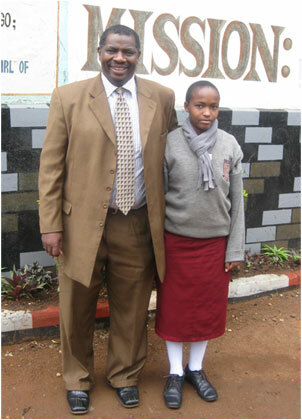 After meeting with the school principal, he arranged for me to see Kioko. He was not told who I was. An amazingly confident student, he revealed to me the miracle of that Saturday he was expecting to go home and languish until a merciful person helped him. I just said that I had heard of him and wanted to know how he is faring in school. I can’t write about his reaction when he finally learned that I was somehow the reason his tuition and fees had been paid. He was speechless. He at last said, “Oh my God!” and covered his mouth with both hands. The next student I met is Pascaline but I am unable to put the suffering of that girl into words. How do you write about a girl who hid herself from teachers so that she could do the end of year exams instead of being taken to the hospital to have her pneumonia treated? That illness did not prevent her from putting her feet in cold water in order to stay awake and study for the exams. I remember doing the same thing, but not when I was suffering from pneumonia. Pascaline, a top student (position 2 out of 80) wants to be a medical doctor. Her academic performance proves that she has what it takes. A sponsor has re-kindled her hope. 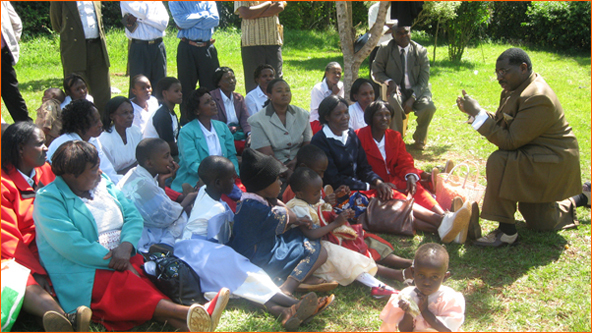 Vincent Kituku addresses parents at Kangundo Redeemed Gospel Church about the importance of educating children on January 24th,2010. These four children are a testimony of how sponsors are transforming young lives! Jones Kaindu, Carrie Barton, Veronica Kalundu, Mary Waeni Nyamai, Dr. Vincent Muli Kituku, Angela Munyasya and Bernard Kivuva after a Caring Hearts and Hands of Hope board meeting in Kenya. Keegan, Quinten and Will building a bench for Kangundo Primary School pupils. on the bench they (sponsors) constructed. 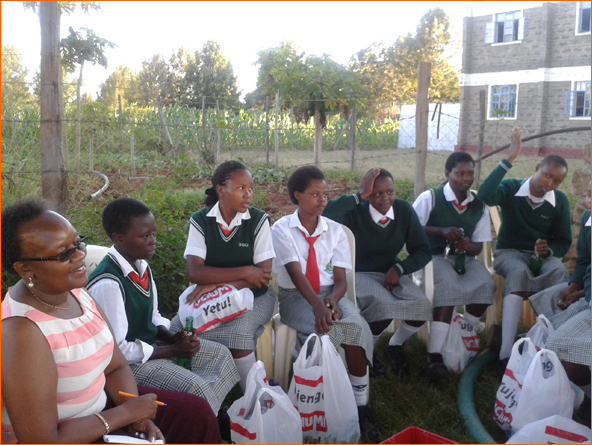 CHHH's sponsored students at Angaza Nguluni Academy. 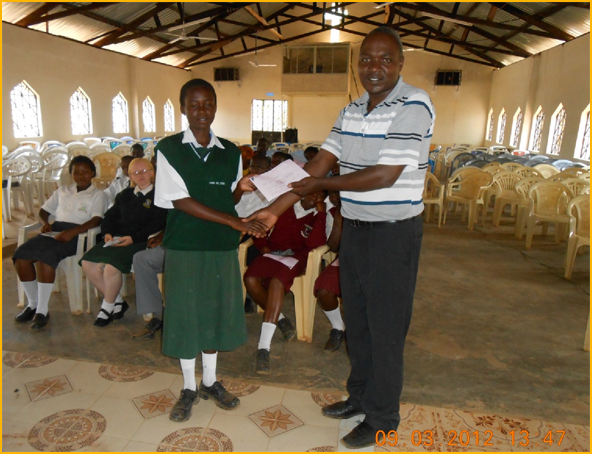 Francisca Mwende Katunge of St Josephs Girls Kibwezi receives her term 3, 2012 fees from Jones Kaindu, CHHH Chairman, Kenya. 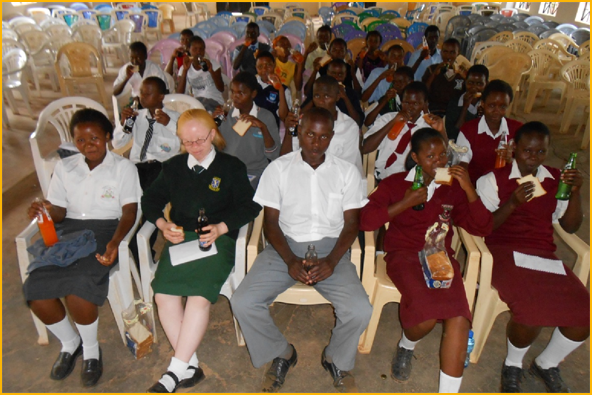 The CHHH Sponsored students enjoying a lunch of bread and soda after receiving their fees.